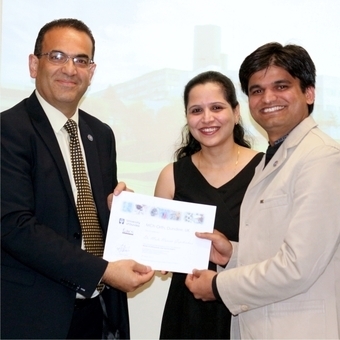 Dr Malu Naveen Gopikishan was presented with the Department of Orthopaedic & Trauma Surgery’s David Rowley Presentation Skills Award from Professor Rami Abboud on May 29th 2016. This prize is awarded annually to the Master of Orthopaedic & Trauma Surgery (MCh Orth) degree student who has best presented their research, orally, by PowerPoint, and visually via a scientific research poster. Dr Gopikishan, and his wife who attended the awards ceremony, informed everyone that they are expecting a child in the next several months for the future. All at the TORT Centre wish them all every happiness. Dr Gopikishan’s research, “Does an audit system detect the need for arthroplasty revision for aseptic loosening?” was supervised by Mr William Hadden (Consultant Orthopaedic Surgeon) and Mrs Linda Johnston (Clinical Audit Services Manager). Left: Dr Gopikishan at the upper limb surgical workshop; Centre: with Professor Abboud; Right: attending the 3rd annual International Orthopaedic & Trauma Symposium at the Royal College of Physicians & Surgeons of Glasgow, 2017. Professor David Rowley, who the award is named after, began his medical studies at Aberdeen University in 1969 and was a lecturer at the University of Sheffield and a senior lecturer at the University of Manchester before taking up a post at Ninewells Hospital and Medical School in 1988 as Professor of the University Department of Orthopaedic and Trauma Surgery until relinquishing his chair and his post at the university in 2008. Professor Rowley was the instigator of the MCh (Orth) Degree at Dundee and served as Director of Education for the Royal College of Surgeons of Edinburgh and was also visiting professor of surgical education at the University of Edinburgh from 2004 until 2009. He has gained many distinctions during his career, including the Gold College Medal and Syme’s Medal, both awarded by the Royal College of Surgeons in Edinburgh. He also served abroad as a war surgeon for the International Committee of the Red Cross in the Sudan and Afghanistan. After 40 years Professor Rowley retired from offering clinical advice in 2014.